The Atlantic Coast Conference announced the 2018 football schedule Wednesday, and once again, it includes arguably the most challenging non-conference competition among the Power 5 conferences. The first ESPN Big Monday ACC matchup of the season is set this evening as No. 5 Duke travels to No. 25 Miami. The game is one of two nationally televised ACC contests on the Monday night, with Boston College’s home matchup against Florida State also scheduled. North Carolina junior Luke Maye has been named the Atlantic Coast Conference Basketball Player of the Week, while Duke’s Marvin Bagley III was named the league’s Rookie of the Week. Following a break on Monday night, the ACC schedule resumes with a total of seven conference games on Tuesday, Wednesday and Thursday. The ACC weekday slate tips off Tuesday night with Pitt traveling to Louisville. The game will be the first league test for the Cardinals, while the Panthers seek to rebound from last Saturday’s loss to No. 15 Miami in their ACC opener. 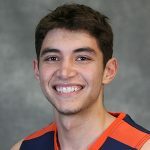 UVA sophomore Ty Jerome has been named the Atlantic Coast Conference Basketball Player of the Week, while Duke freshman Marvin Bagley III earned ACC Rookie of the Week honors. Notre Dame’s Bonzie Colson has been named the Atlantic Coast Conference Basketball Player of the Week, while Duke freshman Wendell Carter Jr. earned ACC Rookie of the Week accolades. 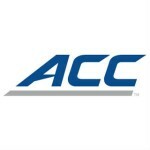 ACC women’s basketball teams will begin an 18-game conference schedule starting with the 2019-20 season, the league announced Thursday. The ACC led all conferences nationally with six of the 20 defensive football student-athletes named Wednesday as quarterfinalists for the 2017 Lott Impact Trophy. The ACC is continuing its sportsmanship awareness campaign by recognizing 2017 Fall Sportsmanship Week through Sunday, October 15. News and notes from across the ACC Football world heading into Week 7 of the 2017 season. The ACC announced the following game times and networks for the football games of October 21. Eight student-athletes from the Atlantic Coast Conference have been named semifinalists for the 2017 William V. Campbell Trophy. The ACC announced the following game times and networks for the football games of October 7. The ACC Football Players of the Week have been recognized following their performances in week four of the 2017 season. 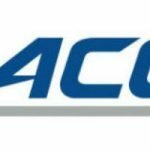 The ACC leads all leagues with six teams listed among Blue Ribbon College Basketball Yearbook’s preseason Top 25 rankings, including three among the top 10. The ACC announced the following game times and networks for the football games of September 30. The ACC Football Players of the Week have been recognized following their performances in week three of the 2017 season. The Atlantic Coast Conference Football Players of the Week have been recognized following their performances in Week 2 of the 2017 season. The Atlantic Coast Conference announced the following game times and networks for the football games of September 23. 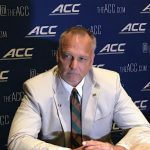 AFP editor Chris Graham joins media interviewing Miami coach Mark Richt at the 2017 ACC Kickoff. Miami coach Mark Richt and players Shaquille Quarterman and Mark Walton talk with reporters at the 2017 ACC Kickoff. Miami coach Jim Larranaga and players talk with reporters about UM’s loss to UNC in the 2017 ACC Tournament. AFP editor Chris Graham leads our live blog as #1 seed UNC faces #9 seed Miami in the 2017 ACC Tournament. Miami coach Jim Larrañaga and players talk with reporters on UM’s win over Syracuse in the 2017 ACC Tournament. Miami fought off a Syracuse comeback in a 62-57 win in the second round of the 2017 ACC Tournament on Wednesday. AFP editor Chris Graham leads our live blog as eight seed Miami faces nine seed Syracuse at the 2017 ACC Tournament. #8 seed Miami (20-10, 10-8 ACC) faces #9 seed Syracuse (18-13, 10-8 ACC) on Wednesday at noon in the second round of the 2017 ACC Tournament. UVA basketball coach Tony Bennett talks with reporters after the Cavs’ 54-48 loss to Miami on Monday.